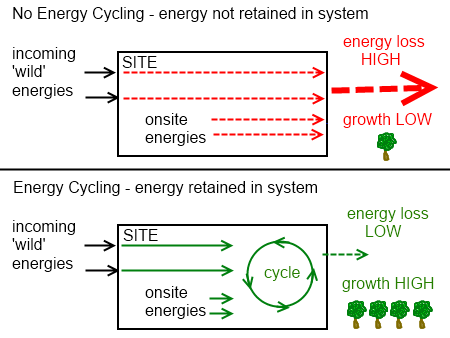 The sixth Permaculture Design principle is ‘Energy Cycling’. This design principle is concerned with the recycling of energy by capturing, storing and using energy on site. In Nature, when energy is cycled, living systems grow. For example, when leaves fall from deciduous trees in autumn, they decompose, providing a nutrient and an energy source to microbes, insects and other plants. As a result, life in this system grows and multiplies. The new plants and insects will eventually reach the end of their lives, and the nutrients will go back into the soil, starting the next cycle of new life. If additional leaves are blown in by the wind from a another location, they too will be added to the resources in this location and the living systems will grow even more. In our Permaculture designs, we seek to capture energy to increase the growth of our living systems, and set in place cycles which will perpetuate life. The strategy here is to take energies flowing through a site and to divert them into ‘cycles’ to allow them to be utilised to ultimately increase the available energy on the site. Energy in every system follows a very predictable pattern, and physics describes one of these patterns as The Second Law of Thermodynamics, or the Law of Increased Entropy. This law states that energy decreases over time by changing from usable energy, which is used in the processes of growth and repair, into unusable energy. Once the energy changes to unusable form, we cannot recover it. Entropy is a measure of unusable energy, so increasing entropy simply means that the amount of unusable energy is increasing. This process can be simply illustrated through the example of rainwater harvesting. When the water is high in the atmosphere as clouds, it has a very high potential energy, that is energy that can be used to perform work. As the rain falls, the potential energy is converted to kinetic energy, that is movement. 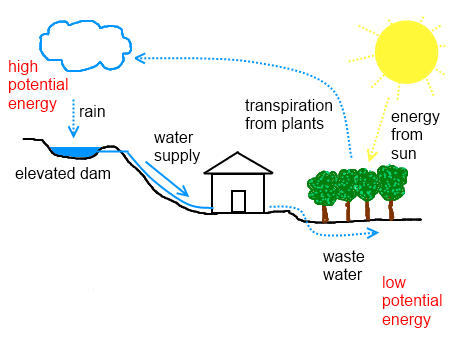 If the rainwater flows into a dam in an elevated location, the remaining potential energy is captured and stored, and can be used to perform work. The work performed is to supply a house and farm downhill with water. Since the water flows with gravity, it runs to the house on its own without the need to be pumped there. When the water reaches the house, it can only flow into the ground as greywater or irrigation water, and can no longer perform work for us. With the sun shining, its solar energy is used by the plants and trees to draw water up some of the water from the ground (this is basically a solar pump), where it is released back into the atmosphere by transpiration from the leaves of plants and trees as water vapour. Atmospheric water vapour regathers to form clouds and starts the whole cycle once again. BUT, if the additional energy from the sun did not pump the water back into the air, the water would have settled at the lowest point in the ground, where all its potential energy would have been used up, this is the position of maximum entropy, where all the energy is unusable. When any energies moving through the system, they will naturally reduce due to entropy. if they are ‘cycled’ to store the energy and contribute to growing living systems, then it does not matter that the usable energy has decreased. If we capture rainwater, sunlight, kitchen scraps and animal manure and use them to grow an orchard, the energy is then stored in the fruit trees. Nature itself is a vast and hugely complex recycling system that transforms matter and energy constantly form one form into another. If we can recreate these natural cycles in our Permaculture designs, we can let them operate on their own in a very energy efficient manner to capture energy and nutrients to build and further grow the living systems on the site we are designing. Through long term capture and storage of energy, the natural systems will progressively grow to enhance the site naturally, which is exactly how Nature does it!